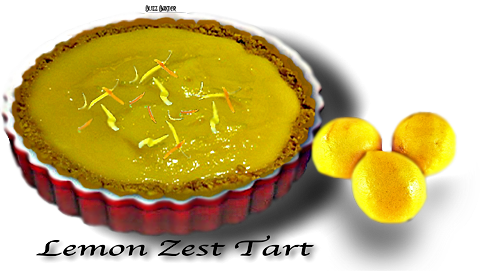 This lemon tart has Middle East written all over it! 1. Form a well with the flour and almonds and place butter and honey in center. 2. Mix honey and butter together with hands to form a paste and then mix with dry ingredients until moist dough is formed. 3. Split in half, wrap in plastic, and refrigerate for 30 minutes. 4. Remove one half and roll out to fit a 10-inch tart mold, walls included. 5. Bake blind with foil and beans until crisp, fifteen minutes and cool. ✚  Lower oven to 360 ℉. 7. Bake until set, 35 to 45 minutes, cool completely, and serve.